Whittier, CA – Under the watchful eye of Le Cordon Bleu Chef Trina Nelson, Los Nietos nutrition staff members transformed strawberries, tomatoes and apples into roses and swans, intent to make healthy food appeal to children. The food artistry lessons were part of a two-day workshop August 8-9 aimed at preparing the District to launch its new cooking menu, made from only fresh ingredients, for the new school year. Nelson, who runs culinary lessons at Dallas School District, taught Los Nietos staff basic knife handling and fresh food preparation skills and practiced cooking items from the District’s new cooking menu. 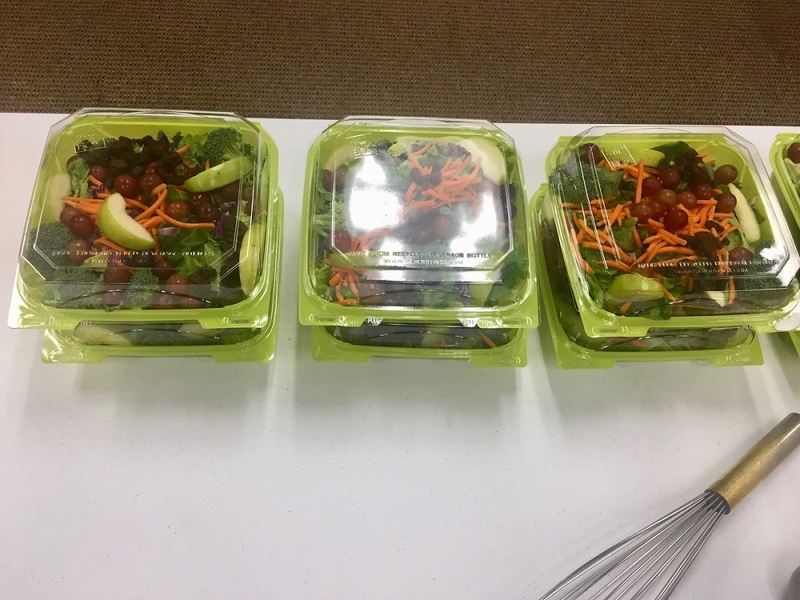 The menu is one of the District’s 2017-18 health initiatives and will eliminate all processed food from school-provided meals in favor of fresh ingredients. Menu items include Chinese Chicken Salad, Go Green Kale and Spinach Salad, all of which the nutrition staff prepared with Nelson on Aug. 9. Unhealthy foods will also be eliminated from classroom celebrations and fundraisers; instead, Los Nietos families will raise money for school programs through fitness activities like jog-a-thons and mud runs. The District’s health initiatives will also extend into the classroom in 2017-18. All students will receive six weeks of nutrition instruction through the Network for a Healthy California program in addition to the existing Harvest of the Month curriculum which is taught monthly. Introduced last school year, Harvest of the Month educates students about a new fruit or vegetable every month. 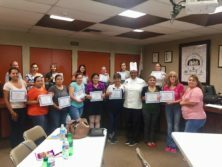 082117_LOSNIETOS_NUTRITION1: The Los Nietos School District nutrition staff completed two days of professional training Aug 8-9 under the direction of Le Cordon Bleu Chef Trina Nelson. 082117_LOSNIETOS_NUTRITION2: Los Nietos School District has launched a new cooking menu this year, made from only fresh ingredients. 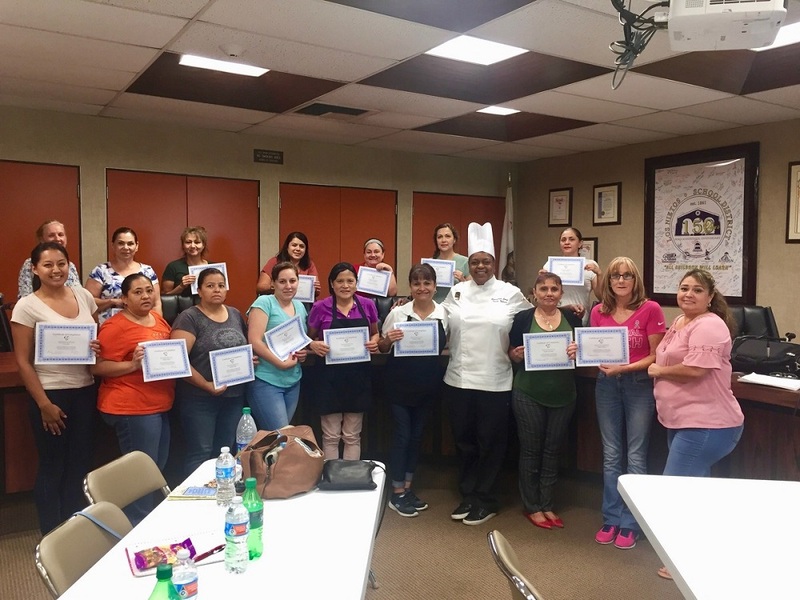 The Los Nietos School District nutrition staff completed two days of professional training Aug 8-9 under the direction of Le Cordon Bleu Chef Trina Nelson. Los Nietos School District has launched a new cooking menu this year, made from only fresh ingredients.